Slinging.org Forum - Show me your Sling! 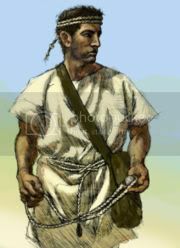 Slinging.org Forum › General › General Slinging Discussion › Show me your Sling! Ok guys and gals, we've been discussing our slinging habits and techniques quite a bit, but a lot of slinging techniques varies with how your sling is constructed. So, what I say is "show me your sling!" 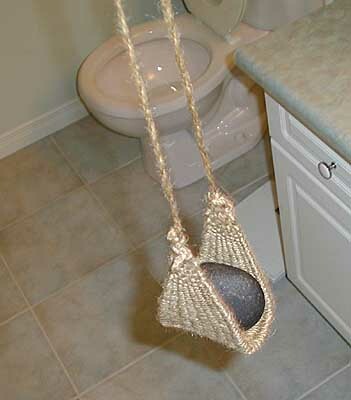 Post some photos of what kind of slings you are using or making (or whatever). I'm starting it a bit prematurely, but I should have a photo of mine up in a couple of days. So what do the rest of your slings look like? Re: Show me your Sling! "Leon's Sling" come on down! Your the next contestant on the Price is Right! I'll post mine in a couple of days as well. I have to gain access to my dad's coveted digital camera first. But I'll have some pic's soon! I will add mine in a few days as well. 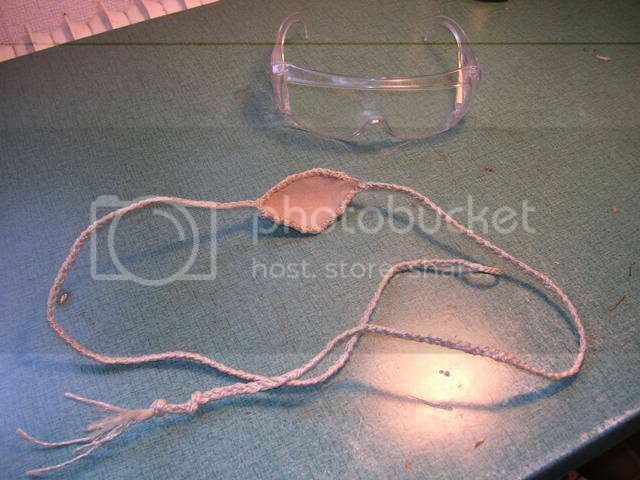 It looks kind of brown (it started as white parachute cord) and I seem to be in the minority because I use modern materials to constuct mine, but I will be glad to share my three rope design. You can now upload your pictures using the forum software. 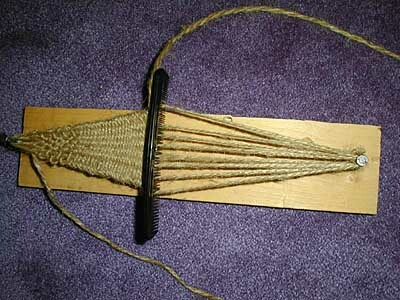 Last winter I made 4 woven slings out of jute. I gave them all away and now Im using just a simple piece of leather with 2 strings. Heres a few pics of the old slings. 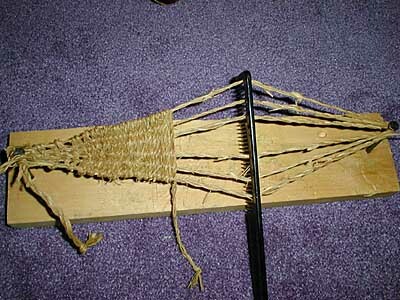 A friend Kris showed me how to weave slings from jute. P.S. How do you make the pics show up directly in the post? Also fixed links so that pictures appear. oh yes, I forgot. Last fall I made a woven sling out of tall field grass. I collected dead leaf blades, soaked them and then made 2-ply cordage out of them. 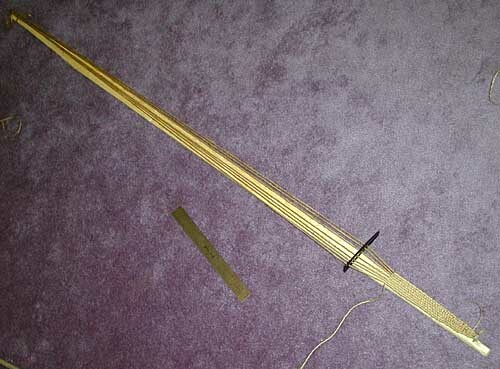 Once I had about 10 feet, I would weave under/over the strands going lengthwise (also made from grass). I made the strings on each end (It was not finished in this pic) out of dogbane fiber because thats where the most strength is needed. Image Rescue Project: Image now hosted at Slinging.org. Also fixed link so that picture appears. Nice work there, Paul. Looks to take even more time than my plaited slings, but much less than Ben's 16 plait Andean style. Neat use of grass, too. Where I am from we just cut it. Paul, that is very cool!! It's probably quite similiar to what very ancient slings were made from (natural fibers like sisal instead of animal materials like wool or leather) Do you mind if I put these pictures up in the gallery under your name? how do i make those loops to the ends??? and is it only one bit of rope?
. In reply #5 Matthias shows briefly how to do it; reply #10 contains more detailed instructions. Made today from what was lying around: packing string and a small piece of soft leather sewn onto it. Its too short (5" off the ground when loaded, should be 1") and the pouch is too small (4,5" of string on each side being not enough). I kowtow to anyone who developed the skills to make a living with such a device! nice sling - and there is no absolutely necessary length. if it works - it's the right length. 3) Leather pouch: Rectangular strip of leather with 4 holes, nylon cord laced through the holes so that centrifugal force automatically closes pouch around the projectile.